Bei One Little Word (OLW) gab es als Inspiration das Wort Pur/Rein. Ich habe das erste Mal mitgemacht und ÃƒÆ’Ã‚Â¼berraschenderweise sogar gewonnen – ein nettes Kit. Bin ganz baff! OLW had as an inspiration the word pure. This is the first time I played along and surprisingly I won – a wonderful kit. I’m totally flabbergasted! 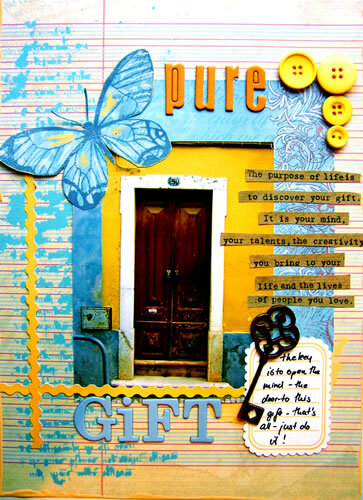 The purpose of life is to dicover your gift. It is your mind, your talents, the creativity you bring to your life and the lives of people you love. The key is to open the mind – the door to this gift -that’s all- just do it. Sodele- nu wieder ins Bett- ich habe Halsschmerzen – nicht gut! Ich hoffe Euch geht es gut! Alright, gotta go back to bed – I have a soar throat! I hope you guys are well! I just LOVE your layouts!! !There so amazing! Have a great day! Deutschland rocks! Kann nicht warten im Winter nach good old Germany zu fahren!!! weheeee, sweetie girl!! ;)) you so deserve it!! oh my goodness this is fabulous!!! The colors, everything!! WOW!!! you totally deserved it: beautiful word, beautiful lo!